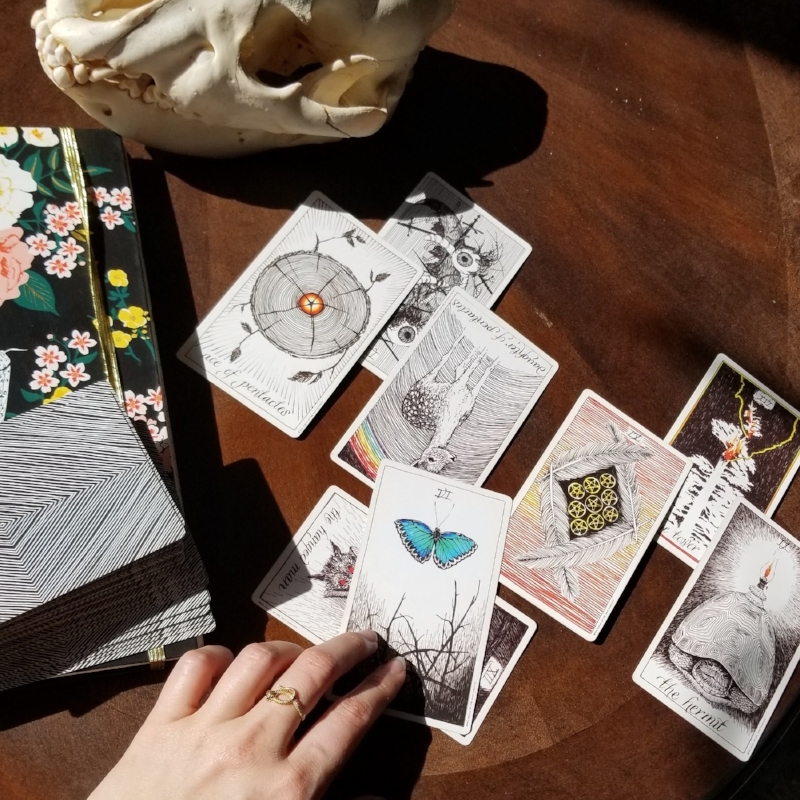 I recently took this magnificent class with Philip Matthews for creative blocks and writing through Tarot (hosted at Oracle). It was phenomenal. I have never had a guided meditation as well as this class - it opened up some parts of my mind that I hadn't realized were blocked. I've been wanting to incorporate poetry and writing with my work for quite some time, but always went to the drawing board blank. The solution, as Philip taught us, was right there in front of us. They were hidden in our consciousness and proved evidence through the cards that we pulled. By imagining ourselves and our project in a void, we were to ask ourselves why and how did we approach our issues? And isn't that a weird way to use tarot cards, you may ask? Answer; It really isn't. Tarot is a fantastic tool that allows you to touch on your subconscious. Our brain is a powerful tool that picks up on subtleties and symbols, reading into the situation at hand from a different perspective. It is almost as if putting yourself into the cards, as another person, looking back at yourself (if you are doing a personal reading) and then reading as a friend would be giving advice. After years of study you learn the symbology and its deeper meanings, separating yourself more to delve into the void as Lyra reading an alethiometer. YOU are actually the tool and the cards are a guide. Sometimes it isn't that easy to read the situation, that's when tarot can help. Separate your deck to the 4 suits, and pull from each to investigate the 4 aspects of your life; what fills your emotions, what are your passions, what drives you, and what are your dream career/aspirations. When things are out of balance that is when we don't feel confidence or have the ability to produce as your are struggling to keep ourselves afloat. Every part of life is important, just like when we don't love ourselves how can we possibly love another. There isn't enough to spread out like too little butter. Friendship, stability, love, career, they all effect how we feel then affect one another. So it always is good to look at the picture as a whole. In my guided meditation I was brought to solve my creative block in a void, where I kept my toe on the ledge trying to grab it and bring it back to where I was originally standing. SO MUCH < DUH. (Honestly, pretty sure Philip is a true magician) but how can that be more obvious that my issues on this project were leaving my comfort zones than the card I kept pulling up (even Philip pulled the same cards for me!) was the 3 of swords. I was holding on the the fear of failure, I was afraid of trying, and I needed help and I shouldn't have felt ashamed for asking for it. How many times we as artists have felt this way. Where we aren't good enough or our ideas aren't valid? Taking the leap for a new project or job that we have always wanted, but the instability is unnerving. Plenty of people who I have spoken to always tell me, 'but that's what being an artist is, that's what drives us'. I disagreed with that having to be norm. Why must we all be starving struggling artists? Why can't we have periods of time of experimental work? I blame art school to a degree forcing us to always have a body/series of work. Needing to be flawless and conceptual at all time. Why must you suppress my urge to draw cartoon cats, art world?! Ha, I'm kidding, but not really... as even after art school days are gone we are encouraged to have curated instagrams and facebook pages to sell our work... cohesiveness always sells. But I guess that's the issue. Unvalued work and hustle overrides the ability to experiment, even though it shouldn't. So take the leap, try that new project. Make the work just because. Dump out the studio and start from scratch (*note to self: take your own advice). Purge and force yourself to take the time. To investigate the possibilities. Make something ugly. Pulling more cards I found I wasn't giving myself enough time, nor patient enough. Rushing the projects, or focusing too much of my energy solely on my other business. Solution? Going to stick to a new routine and studio days strictly for myself. Start saying no more to things and stick to that - maybe even a studio week in the middle of the Ozark? Who wants to go with me?! It's finally come to the time where I myself need to immortalize a beloved friend. My heart goes out to anyone else who has had a recently deceased pet—it's hard. And it's times like these when it's clear that memento mori are still frowned upon, especially in the traditional sense of a traditional pet world. 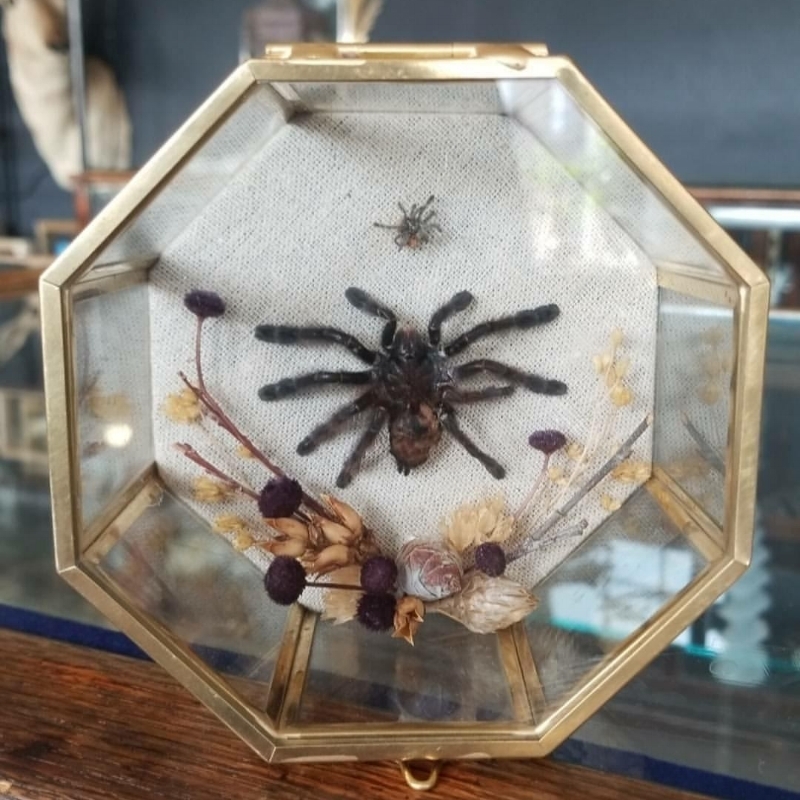 There are endless venues for cat or dog memorials, but I am here to tell you that my pet tarantula passed away and, yes, we can have emotional connections to such small, humble souls. No matter the pet, they mattered—to you and and to me! It's amazing the connections we can have if we have taken the time to make them. The feelings are valid because of that time. And just because they aren't conventional beings it doesn't make it any less meaningful. So here's to my unconventional friends; this is Sable. She was my first tarantula and she died unexpectedly while I was out of town. It is the worst way possible to lose a friend. Where do I even begin to tell her story? She was a babe blue spiderling when we first met. I had wanted a tarantula ever since I was nine (the ultra-embarrassing backstory: it was from watching Jungle 2 Jungle as a child and seeing that beautiful Red-knee Tarantula on screen). Although I must admit that I also have a fear of spiders: but living in fear is probably the worst thing you can do for yourself. The more we grow older the more fears we wrack under our belt. It just seems to be the weird nature of adulting. Our conquering souls, fearing nothing, challenging the kid off the top of the jungle gym get replaced with worrying about how can we pay our bills. Sable helped me to cross off one of those fears and get me back to reality. Maybe I am romanticizing a bit here, but I truly believe we understood one another. I got over zealous the day that I got her and moved her into her new home I had made for her... and that was the first time I held her (not intentionally!). She crawled to my hand instead of the cozy new home. I froze. My instinct of flicking my hand surprisingly did not trigger. And I wonder now, was that the unconscious moment (of 'hey girl, we friends now or what?') where we were connected forever? I had no idea what I was doing as a tarantula mom, but she seemed to show me in her mannerisms what to do. It was a beautiful friendship. Pet preservation isn't just something I do for fun; I do truly take it very seriously and personally. Preserving a pet tarantula, articulating a cat or a rat, it is all the same to me—an extension of that person, our best friend: a connection that will be memorialized forever. It means the world to be to be able to do the job that I do for you. These interactions we have everyday aren't just mere conversations. The simplest of time spent connects us in a way, no matter how small. So, treat each second as an important, inspiring moment. Because you too matter to someone much bigger or smaller than yourself.